My name is Leonie, Leonie Galina Hochrein. “Leonie” was the only name my parents had in common when they made their lists with names they could imagine for me. It comes from Latin for “Lion”. My second name, Galina, is an Eastern name, meaning “the calm”, to harmonize the lion. I am an introvert. I love being silent, I love to discuss, I love to be in nature and to be with animals. I love asking unusual questions and to see, what happens. I fell in love with humans a while ago, though still I am often scared of what we call civilisation. I did this project as a challenge, and it became a beautiful journey to more places and with more faces than I could have imagined. What makes me happy... A lot, lot, lot of things. First of all, awareness and gratitude of what I have, where life put me, makes me happy. 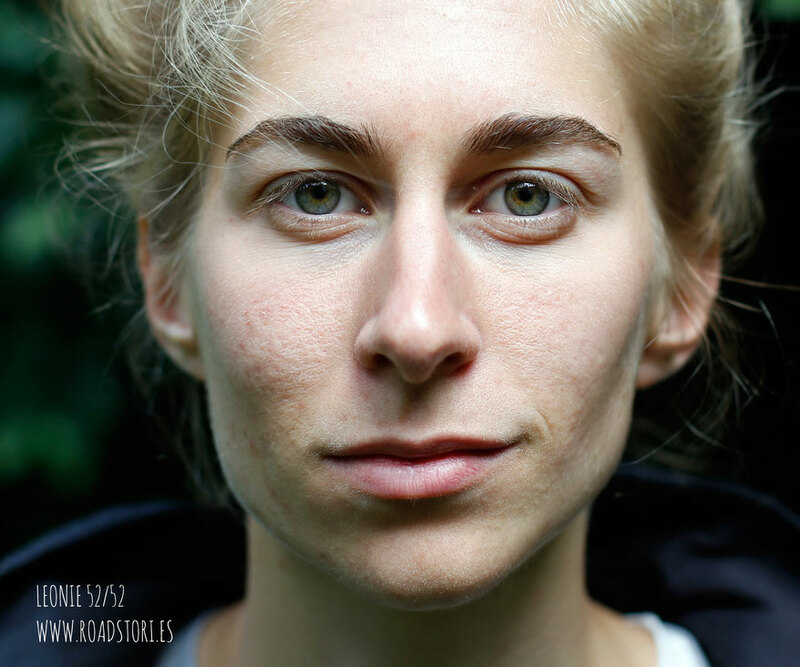 Leonie did complete the ROADSTORIES Project - except her own interview. The following text was found on a postcard for the ROADSTORIES Project. It is the last text Leonie wrote that is maintained for us. Leonie died on the 3rd of August on an alpine mountain tour in Switzerland with her boyfriend Simon and their mutual friend Stefan. I feel like a little girl – Plus what I've learned of 3 years in art school. I feel like a little girl again. I feel the soft pine needles under my bare foot, the soft cool meadow, warm stones. I am climbing boulders playfully, I run, I jump. I just feel at the right place at the right time. The view I woke up with this morning was magic, was something I'd never have expected to wake up with the age before. We spontaneously decide to take a day for bouldering in switzerland to meet with a mutual friend before doing the alpine tour. We pick up Stefan in Ulm and meet with Simons uncle in Lindau. In the night, we drive up the little windy road, more up, more and more up until a little nishe, right behind a boulder, and right in front the open view in the valley. And now, I feel like a happy kid while exploring unbeaten paths. In the forest, washing my hands in the river, enjoying the shadow of the trees. Recently, I wrote in a Facebook post about finding abundance in simplicity. I feel that I got everything at the moment. My friends are strolling through the boulders – This has nothing in common with working out on plastic grips in a boulder gym. This is playing. What else is bouldering than playing with your physical creativity? Funnily enough, the necessity and overall importance of play is what I take with me from 3 years of proper, serious art university. You need an empty space so that creativity can fill it. We are used to be very busy. I am an expert in always having my calendar filled. I am not necessarily talking about an empty time frame (which is for sure healthy and helpful), but something I've called Headspace. when waiting for the bus or train. We usually don't allow emptiness, because it's also a space for emotions to come up we don't want to feel. If they come, don't shut the door. Trust me, they will wait until you let them trespass, and they are more patient than you can imagine. You can also translate the empty space with being in the moment. I compare a running shower to thoughts running free. Creativity finds its way. It's like water. If you block it for too long, it can be devastating. But if you let it flow frequently, it will help you to overcome... Well, everything. I am dreaming of a creative life. A life, where I can run through boulders, no matter how old I am. A life, filled with play and lightness.